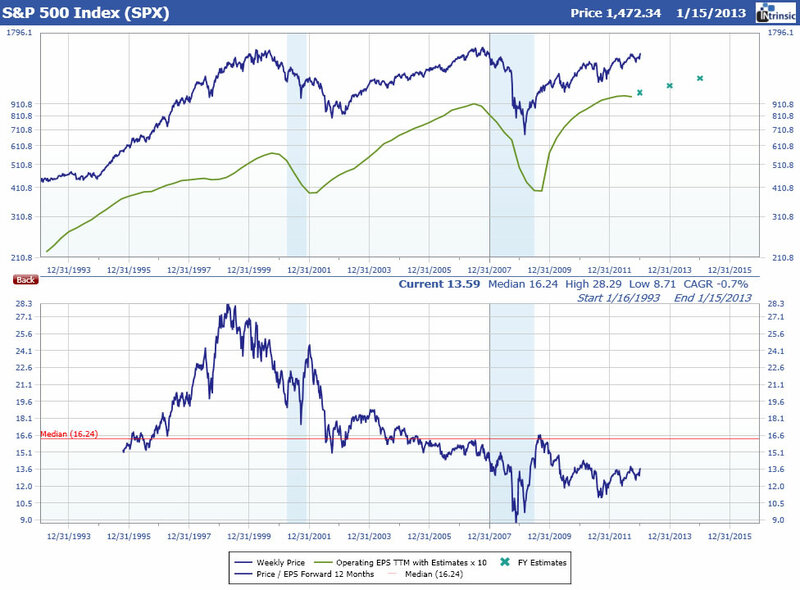 Since the stock market bottomed in early 2009, there have been four corrections in each of the last three years. The latest started in mid-September after the S&P 500 reached a recent high above 1,460. All four have involved concerns relating to the European debt problems, weaker-than-expected economic statistics, and frustration over the lack of meaningful fiscal progress from Washington. With a fresh memory of the latest Bear Market from 2007-2009, each pullback has caused investors to question if it is the beginning of the next Bear Market. So, how do we decide if it’s a correction in a longer-term Bull Market or a much more serious Bear Market? The chart to the left presents the price and earnings of the S&P 500 over the last 20 years. Click it for a larger view. During this time period there have been two Bear Markets (2000-2002 and 2007-2009). 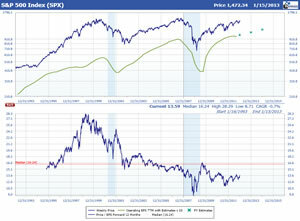 In each case, stock prices were responding to an economy moving into a recession (shaded periods on chart) and declining earnings for the S&P 500. However, surrounding these Bear Markets, price corrections were relatively common even though the overall trend was up. Therefore, when trying to determine whether stock prices are simply correcting or signaling the start of a Bear Market, we believe it is important to ascertain if the economy is headed for recession, and if earnings are peaking and likely to meaningfully decline. As analysts, we look at many different indicators to get a thorough reading of economic and market trends. However, some signals are more meaningful than others. In our opinion, the single best indicator to predict a recession is the yield curve. The yield curve by definition is the difference between longer-term interest rates and short-term interest rates. Commonly, analysts compare the 10-year Treasury rate to the Fed Funds rate to determine the shape of the yield curve. The 10-year Treasury rate tends to be determined by market conditions, and the Fed Funds rate is set by the Federal Reserve Board. Presented to the right is a chart of the difference between the 10-year Treasury bond rate (long rates) and the Fed Funds rate (short rates) over the last 50 years and last 7 recessions. Click it for a larger view. By market definition, a “normal yield curve” is when long rates are higher than short rates (line is above zero). Likewise, an “inverted yield curve” is when short rates are higher than long rates (line is below zero). 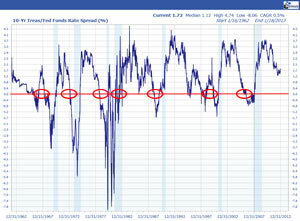 Prior to each of the last seven recessions (shaded bars on chart), the yield curve was inverted with short-term rates higher than longer-term rates. In our opinion, an inverted yield curve is an indication that the Federal Reserve Board has inflationary concerns and is looking to moderate economic growth and constrain credit creation. Currently, the yield curve is positively sloped (longer term rates above shorter term rates) which does not suggest a recession is imminent. In addition, the Fed has stated clearly their intentions to remain accommodative for the foreseeable future. Economic growth is further supported by steadily improving labor conditions, expanding credit creation, significantly de-leveraged consumers and corporate balance sheets, and even signs of an improving housing market and modest inflationary pressures. Since their bottom in early 2009, the price of the S&P 500 is up over 100% and earnings are up over 150%. In effect, this combination has pushed the price/earnings valuation on forward earnings down to 13.6 which is significantly below its long-term average of 16. In our view, the absence of an imminent recession combined with continued rising earnings suggests the trend is stock prices are still up and a meaningful Bear Market is not imminent. However, investors will likely need to endure periodical corrections relating to the latest headline concerns. At 13.6 times forward earnings, the S&P 500 seems to be discounting investor’s lack of confidence. In our opinion, the current expansion is underappreciated and, therefore, opportunities exist to achieve attractive investment returns.